Mia Hansen and Alexandra Hauglum join hands in front of photos of their adoptive homelands. Photo: Moment Film. It’s not every day that you get to see the work of a Norwegian documentary filmmaker on American TV, but tonight I encourage you to jump at the chance to catch the U.S. broadcast premiere of Twin Sisters on Independent Lens (PBS, Monday, October 20, 2014, 10:00-11:00 p.m. ET. Check local listings for air times and repeat broadcasts in your region). This lovely film by Mona Friis Bertheussen is well worth an hour of your time and will not only touch your heart, but should also tap a special place in your soul no matter what your spiritual beliefs or affiliations. In 2003, two baby girls were found abandoned in a cardboard box in China. They were separated by Chinese authorities and put up for adoption. The two girls melded into a larger population of orphaned children, and were adopted separately yet simultaneously by an American couple and a Norwegian couple, respectively. Despite the geographic distance between them, the two couples faced remarkably similar issues and challenges that compelled them to adopt (age, second marriages, infertility). As the legal papers sealing the girls’ respective adoptions were about to be finalized, a twist of fate brought the two couples face to face. The new moms had incredibly dressed their babies in identical red gingham dresses purchased at different times in different places. It was also impossible not to notice that the baby girls seemed to share the same facial features and birth dates. But when the couples asked the Chinese authorities the obvious question, albeit nervously, they were assured that the girls were not twins. A fateful fleeting touch during the twins’ final days in China. Photo: Moment Film. Torn between a sense of relief and unease, the girls’ adoptive parents exchanged contact information, took the girls home (Mia to Sacramento, California, and Alexandra to the remote Norwegian village of Fresvik) and raised them in loving homes. Subsequent DNA tests one year later proved that the girls were identical twins. 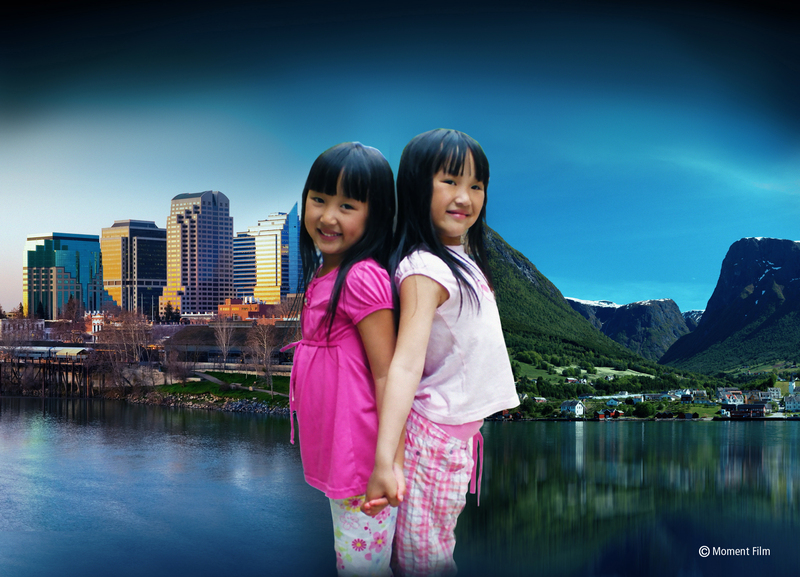 Twin Sisters follows their progression from infants to pre-teens, via the parents’ honest recollections and girls’ reflections, juxtaposed with profuse home movie footage that begins in China during the final fateful days of their adoption process and ends with the American family’s visit to Norway when the girls were eight. A major focus is on the sweet bonding process that envelopes the girls despite their huge cultural, language and geographic divide. Mia Hansen and Alexandra Hauglum share a quiet, heartfelt moment when they are reunited in Norway. Photo: Moment Film. Mia has grown up as a protected but socially active girl enjoying all the benefits of an upper middle class lifestyle (soccer, Girl Scouts, sleep overs, violin lessons, lookalike American Girl dolls); while seemingly middle class Alexandra accepted her isolation in her breathtakingly beautiful village where she is safe to roam freely and enjoy her beloved animals and winter sports. The film is a fascinating, often touching look at how these identical twins come to know and love each other and overcome the barriers that continue to keep them apart. Although they’ve been raised on opposite sides of the planet and speak different languages, the twins share amazing personal behavior patterns that could only (as American mom Angela confirms) be genetic. Hopefully, director/producer Mona Friis Bertheussen will be inspired by British director Michael Apted‘s award-winning UP series and continue to follow Mia and Alexandra into their teen, young adult and middle-aged years to see where life takes them. This entry was posted in Film, TV and tagged Adoption, China, Chinese Americans, Family Relationships, Independent Lens, Mona Friis Bertheussen, Norway, Norwegian Cinema, PBS, Twin Sisters, Twins, Women's Issues. Bookmark the permalink. Thumbs up or down, your blogs are wonderful to read—I always look forward to seeing what you write about. Thanks so much, Doris! Truly appreciate your support! Looking forward to seeing this. Thank you for your excellent blog. Thank you, Bruce! This is a beautiful, amazing story that hopefully will be followed by another film as the girls grow up.